So, Pat (aka Fishman33) has asked for some pics of how my Benchdog Router table is attached to my SawStop. This is a pic of my SawStop PCS before I built my new “station” for it. The tablesaw “wing” setup has not changed from this pic, only the base has changed. From the back of the saw, moving to right to left, the wings are SawStop Sliding Table in place of the wing. 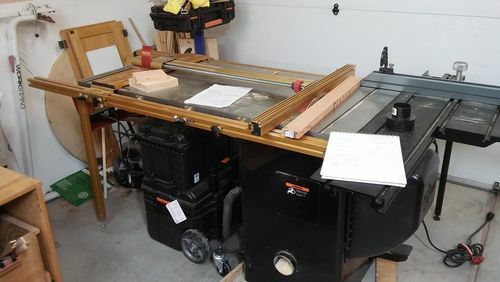 Then the Saw, Solid Extension Wing, Solid Extension Wing (this one was formerly where the Sliding Table is now) and then the Benchdog Cast Iron Router Table. One of the reasons I did it this way was because I have the Incra Fence. The Benchdog’s holes for attaching to the saw align perfectly with the holes on both the saw and the extension wings. The Benchdog is attached to the extension wing and also the fence rails. The rails are supported at the end by legs, so they are actually bearing some of the wings’ weight. Since the picture, I have cut the Incra fence rails down so they don’t extend past the router table, and I’ve put the saw into a new mobile base. -- I'm happier than a tornado in a trailer park! Grace & Peace.